We present below the keynote address of the evening, delivered by Hadhrat Mirza Masroor Ahmad(aba). “Assalamo ‘Alaikum Wa Rahmatullahe Wa Barakatohu – peace and blessings of Allah be upon you all. As we are all aware, and as the distinguished guests have just mentioned, today we are gathered here to celebrate the Golden Anniversary of the independence of Sierra Leone, Tanzania and Cameroon. Today’s event has been organised by the Ahmadiyya Muslim Community’s Pan-African Association, and so on behalf of our Community, I would like to thank all of the distinguished and honourable guests for attending this event. The Ahmadiyya Muslim Community was formed in 1889 by Hadhrat Mirza Ghulam Ahmad of Qadian(as). We, Ahmadi Muslims, believe him to be the Promised Messiah(as), Imam Mahdi and the Reformer of the Age. We believe him to be the very Messiah and Mahdi of the Latter Days, whose advent was foretold by the Holy Prophet(saw). Indeed, we also believe that Hadhrat Mirza Ghulam Ahmad of Qadian(as) is the same reformer whose advent was prophesied by other previous prophets, and who was to come in the servitude of his master, the Holy Prophet Muhammad(saw). Upon his advent, the Promised Messiah(as) outlined two great and overarching purposes for which God Almighty had commissioned him. Firstly, he was sent to establish and to develop a relationship between man and God Almighty. It was his objective to make mankind realise that its Creator is the One God, Who is the Lord of all the worlds and the Possessor of all powers. As such, the Promised Messiah(as) spent his entire life reminding mankind that they must submit and bow down before the All-Powerful God. He came to inform people of the world that they should realise that all of the powers and forces of the universe are nothing in comparison to the Might and Power of God Almighty. The second purpose for which the Founder of the Ahmadiyya Muslim Jama‘at was sent, was to make mankind aware of the rights owed to one other. This was something that he greatly emphasised throughout his life. The Promised Messiah(as) taught us so beautifully that if a person becomes aware of the rights owed to his fellow man, then this would naturally lead to the establishment of human values. When human values are established, then man would cease to be cruel to his fellow man. Hence, his teachings formed the basis for true peace. The Promised Messiah(as) stressed the importance of discharging the rights owed to mankind to such a great extent, that he taught that on certain occasions the rights owed to man are to take priority even over the rights owed to God Almighty. This, God forbid, does not mean or imply that the All-Powerful Creator has no significance in comparison to man, or that He is in any way secondary; rather, it means that God Almighty has such love for His Creation that He Himself has instructed that on those occasions where humanity is in desperate need, we should assist them first. Thereafter, once the need has been fulfilled, man should return to the worship of God Almighty. In short, we believe that even though the purpose of our creation is the worship of God, this objective becomes secondary on those occasions where humanity requires our immediate assistance. This point is in exact accordance with the true teachings of Islam and the commands of God Almighty. The teachings of Islam are most beautiful. They stress the importance of fulfilling the rights of others. Unfortunately, those in power have generally ignored this basic principle. 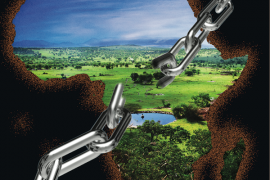 If we look at the world’s political situation today, we find that there are different systems of governance, and different laws that have been established. On the one hand, there are those countries where monarchies or dictators rule. In such countries, we find that the people are given very few rights. Instead, the rulers withhold most of the powers and rights for themselves. As a consequence, restlessness and anxiety spread amongst the people of that nation. On the other hand, we find those countries that have adopted democracy. The basic principle that underpins democratic societies is that the general public speak of seeking their own rights. They expect that their leaders will represent them fairly and without discrimination. However, even in such democratic countries there invariably comes a time when the policies made by the ruling party do not measure up to the required standards of justice. Policies that claim to advocate justice are not properly implemented, whilst laws giving preferential treatment to certain people or bodies are routinely passed. Thus, even in democracies we regularly find injustice. Islam however, teaches an altogether different approach. In this era it is the Promised Messiah(as) who has explained to us the code of conduct that Islam has advocated. He explained that Islam teaches us to forsake our rights for the benefit of others. Islam teaches selflessness rather than selfishness. Islam teaches that a good person is he who would prefer to fulfil the rights of his fellow man, instead of prioritising his own rights. It is only when a true spirit of sacrifice develops within a society that a person happily chooses to relinquish his own interests for the sake of others, and values the rights of others more than his own. When such a spirit of mutual sacrifice is born then true peace will emerge in that society. There is no doubt in this. There is insufficient time to speak about this matter in detail at this time. I wish only to inform you that wherever the Ahmadiyya Jama‘at is established, it strives to fulfil the rights of others with this very spirit of sacrifice that has been taught by Islam. The members of the Ahmadiyya Community worldwide regularly make financial sacrifices and give alms. They do so not to gain any worldly benefit or recognition, but simply to serve God’s Creation. 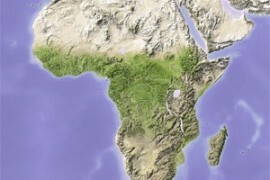 As you may be aware the majority of our humanitarian projects are based in Africa. With the Grace of Allah, over the past eighty or ninety years, we have strived not only to bring the African people closer to Allah, but also to discharge the rights owed to the people of this great continent. It is in this spirit that our Jama‘at has opened many schools in Africa. It is with this spirit that many of our Ahmadi engineers, who have been trained and brought up in the West, travel to the remotest parts of Africa to try and provide a supply of drinking water to the poor and deprived local villagers. With this spirit of sacrifice our youngsters, who have been brought up in the comfort of the West, have spent night upon night in the far off jungles, installing hand pumps in an effort to provide drinking water to humanity. In the same way our Ahmadi teams have provided electricity to people living in the remotest parts of Africa, by installing solar panels. Also, now in certain countries we have started a new project of creating model villages, in which facilities such as tap water, electricity, street lights, community centres and paved streets will be provided Insha’Allah (God Willing). Our Ahmadi youngsters take no payment for this work. Indeed, they spend their own money to take part in these projects because they wish to fulfil the command of Allah, which is to serve humanity and fulfil the rights owed to mankind. Whilst it is true that in our hospitals we do take fees from those who are wealthy and well-off; we also treat thousands of poor people each year for free, who otherwise would be in no position to attain such treatment. We provide such services not as a favour or with a desire to seek reward. Our only motivation is to fulfil our duty to serve humanity. With the Grace of Allah, the local Ahmadi Muslims who are relatively well off financially, use their wealth to support and help the people of Africa, irrespective of religion, through the various schemes and projects run by the Ahmadiyya Muslim Community. I myself lived in Ghana for over eight years and during this time I became extremely familiar with the temperament of the African people. Generally speaking, it is part of the character of the African people to willingly make sacrifices to help and support their friends and relatives. 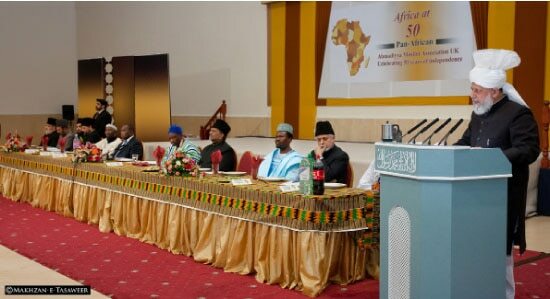 Nevertheless, the spirit of sacrifice has become even stronger in those African people who have converted to Ahmadiyyat. God Willing, our Jama‘at will continue to maintain this passion to serve and will be willing to make all necessary sacrifices in an effort to help the people of Africa. Regarding the independence celebrations, I should also mention that our Community existed in certain African countries even before independence was achieved, as I have said earlier. 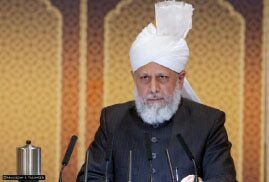 In those countries, with the Grace of Allah, the Ahmadiyya Jama‘at always played a very positive role in helping the country progress towards freedom. For example, when Sierra Leone’s independence was achieved, its Government officially recognised the role of our Jama‘at and the humanitarian services it had rendered, to both the country and to its people. The Government did this by specially inviting a central representative of the Ahmadiyya Muslim Jama‘at from Pakistan, to attend the main function marking the country’s independence. The Head of the Ahmadiyya Community at the time, Hadhrat Mirza Bashir-ud-Din Mahmud Ahmad(ra), the Second Khalifa, thus sent an Ahmadi who was a High Court Judge in Pakistan, Sheikh Basheer Ahmad Sahib, to attend on behalf of our Community. His comments and suggestions were received with much appreciation and respect by the then Government. An example and proof of this can be seen in one function that took place in Bo, Sierra Leone, when a senior magistrate, Mr Banja Tejan-Sie, addressed the gathering. 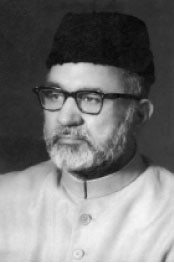 When speaking about Sheikh Basheer Ahmad Sahib, the magistrate said that only that respected judge could have reminded them about their responsibilities, in such a magnificent way. He said that his manner and words had touched their hearts, and were extremely inspirational. He also said that if the people of Sierra Leone were able to act upon his words, then they would be able to transform their circumstances and travel on a path of progress and advancement. It is of note that Mr Banja Tejan-Sie was later appointed as Acting Governor-General of Sierra Leone. 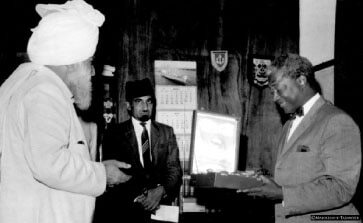 In the capacity of Acting Governor-General of Sierra Leone in 1970, he hosted a State Dinner in honour of Hadhrat Mirza Nasir Ahmad(ra), the Third Khalifa of the Ahmadiyya Muslim Jama‘at, at the Governor House. Since the independence of Sierra Leone was achieved, there have been a number of Ahmadi Muslims who have had the honour of becoming Members of Parliament, Ministers of Government and Ambassadors of State. In this way many Ahmadi Muslims have been able to serve Sierra Leone with great distinction and become a means for the progress of the nation. Similarly, upon the independence of Tanzania, the Ahmadiyya Community was also able to play a significant role. One of our local Tanzanian Missionaries, Sheikh Amri Abedi, who received two years missionary training in our centre in Rabwah, Pakistan, was also personally able to play a valuable role towards the independence of Tanzania. The leaders of the country used to consult with him regularly and seek his wise counsel. Later on he was appointed the first African Mayor of Darus Salam. 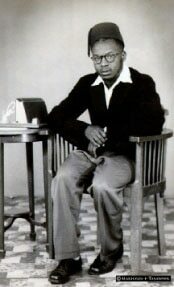 He was also elected unanimously to the Legislative Council of Tanganyika, and then in 1963 he was appointed Minister of Justice and proved to be greatly loved and popular in this role. Therefore, throughout his life he rendered great services to his nation. Another example of the services rendered by the Ahmadiyya Community is that the name ‘Tanzania’ was actually chosen upon the recommendation of an Asian Ahmadi Muslim, to the Government of the time. This too was an historic service to the nation. Hence, these are just a few examples. In fact, the Ahmadiyya Community has continually offered great services to the country. In short, the Ahmadiyya Jama‘at has played and continues to play a prominent role in providing the rights owed to deprived people, to serve them and to strive for their freedom. We do this without any desire for personal gain or self-interest. It is my heartfelt prayer that the African people are able to take full advantage of and benefit from their independence. They should strive to utilise their natural resources for the betterment of their people. All countries should keep in mind the saying of the Holy Prophet of Islam(saw), that the leader of the country is the servant of that nation. This is a crucial point to remember. Whichever laws or regulations are in force, should apply just as much to the rich as to the poor. If this approach is maintained, then, God Willing, the freedom that you have gained after long periods of colonial slavery, will come to be everlasting. If, however, you do not follow this, dominant world powers will surely seek to once again enter your lands and take over your natural resources through their deceitful schemes, or on the pretext of their various unjust and false excuses. But if the leaders of the poorer nations fulfil the rights of their own people and the people themselves give precedence to the interests of their nation, then the country will progress, Insha’Allah. Indeed, if all the countries of Africa adopt such a course then there is no doubt that Africa itself will progress at great speed. I firmly believe that if the African countries and people unite together and fulfil the requirements of justice, then one day, Africa will emerge as a true global power. May Allah enable this to happen, Insha’Allah. At the end I would like to once again thank all of the honourable and respected guests for attending tonight’s function. Thank you very much.